When buying hardware for a graphic design setup, people will often look at getting the fastest, most powerful system on the market. They'll probably get the most up to date version of the best graphic design software. Although these things can be important, some designers will often forget about getting a large quality display for working on their designs. Having a larger good quality display makes it a lot easier to view your work, puts less strain on your eyes, and allows more flexibility when working with a few programs open at once. Wide screen is the way to go these days, allowing more room to the side of your screen for palettes, or for working with screen movies and that sort of thing. Combining a larger display that has a wide screen aspect is what most graphic designers are opting for. 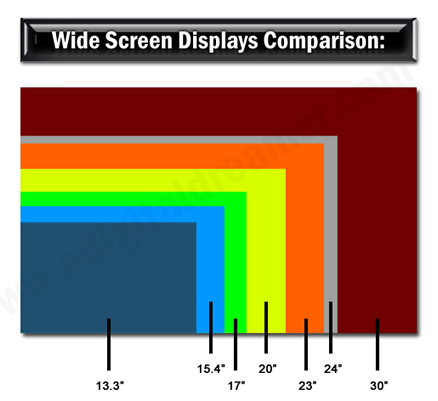 We've broken down the sizes of the most common wide screen display sizes from smallest to largest in the diagram below. We started with a 13.3" screen size, which happens to be the size of the screen of the latest MacBook from Apple. A few other computer manufacturers have adopted this size as well. But this is a poor choice for doing graphic design work. At the other end of the spectrum is the amazing beautiful 30" screens, which are sure to knock the socks off of anyone. Both Apple and Dell make great 30" screen displays. Dell currently offers the 30" UltraSharp Widescreen Flat Panel Monitor, while Apple presents to us the top notch 30-inch Cinema HD Display. Both are insanely expensive though! Upper / mid range displays. If you have just under $1000 to spend on a display, take a serious look at the Dell 24" UltraSharp Widescreen Flat Panel Monitor, which can be had for as little as $700 (if on sale). Apple offers a 20" Cinema display for around this price as well. Dell potentially offers more bang for the buck at this price range though. It's up to you to decide if a slightly higher quality Apple display is worth paying the same for a larger Dell display. More and more designers are going for the larger display, although either choice is excellent. What about other companies? While there may be some gems out there for a good price, we have yet to come across a display that is of the same quality of the Dell and Apple displays. There seems to be a drop off in terms of color accuracy, contrast, and overall sharpness and quality of the image. An important thing to check before buying one of these displays is if your computer can handle it. The higher end displays mentioned here require a DVI or HDMI port on your computer. MacBooks require an adaptor to make this work. Another thing to pay attention to is your graphics card, and what resolutions it supports. 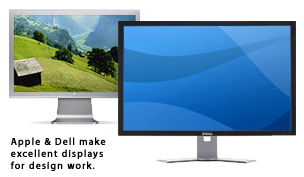 The Dell 24" and Apple 23" Cinema displays for example require a graphics card that supports a resolution of 1900x1200. So check the requirements of the display you are looking to buy, and see if your computer meets the requirements. There are two options for those who opt for multiple displays when it comes to what is shown on screen. The first option is to have the exact same image being shown on both screens (like a mirror image). The most useful use of a multiple display setup though is expanding your desktop view. By opting for this setup, you could have your smaller display being used just for palettes in Photoshop, while the other display shows the actual image. Or have Dreamweaver open in one screen, and the other showing the preview of the site in Internet Explorer. This can really kick your productivity into high gear. If you are hoping to have a second display expanding your desktop, just make sure that your graphics card supports it. The new MacBook for example only allows mirroring, where as the MacBook Pro allows both. In summary, the quality of your display for doing graphic design work should not be overlooked. Don't go cheap and end up squinting all day. A good display setup is a great investment, and one that will most likely stay current longer than other hardware that you will be investing in.